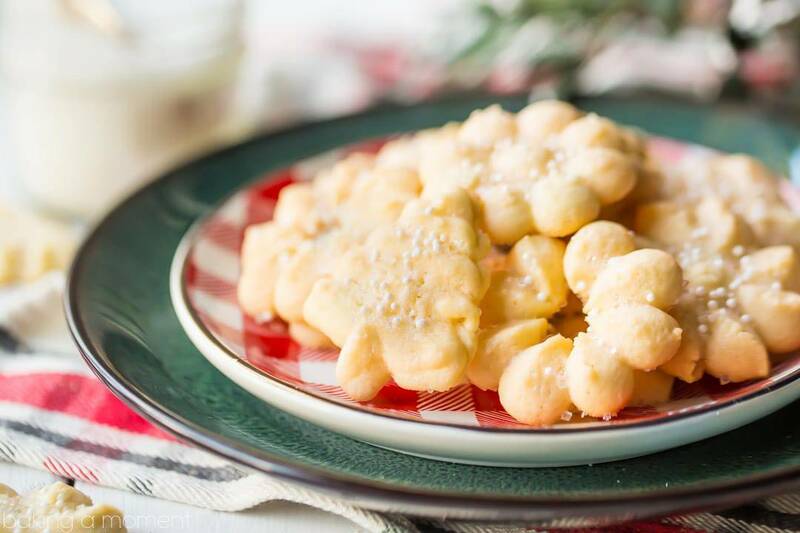 Light, crisp, and so buttery, these spritz cookies are a beloved holiday tradition. So good with a warm cup of tea, coffee, or cocoa! These cookies bring back SO many memories! When I was little, there was really only one kind of cookie we ever made, and they were spritz. We had a copper cookie press with a screw on the top, and we’d turn the screw, watch the dough come out, and then sprinkle the tops with colored sugar. It was a Christmas tradition, and one that I looked forward to all year long! So, when I decided I should have a spritz recipe here, I messaged my mom and asked her if she still had the one we always used to use. And she told me that the recipe had come from her sister, my Aunt Barbara. She told me Aunt Barb would make them every year. It was HER tradition! In fact, she had so many Christmas traditions. She was really into Christmas, and would always work so hard to make sure it was special for everyone in the family. Cookies, gifts, decorations, all of it was led by Aunt Barbara. So I’m really happy to be able to share this here, in honor of my Aunt! A LOT of batches of spritz cookies made this post possible. I wanted to make sure I had everything just right! So, I did make a few tweaks to the original. But I think Aunt Barb would approve! Cream the butter and sugar together until very pale and fluffy. This takes about 5 minutes with an electric mixer, and it will help your cookies to be so light and tender! Don’t overwork the dough once the flour has been added. Just mix until the flour is incorporated and then stop. Otherwise, your cookies could come out tough. Don’t grease your baking sheets or line them with parchment paper. Usually, I’m a parchment paper girl, but in this case it will cause the dough to adhere more to your cookie press than to your baking sheet. You might need to click the cookie press more than once to get the dough to release. Bake just until beginning to turn golden around the edges. Store in an airtight container for up to two weeks at room temperature. 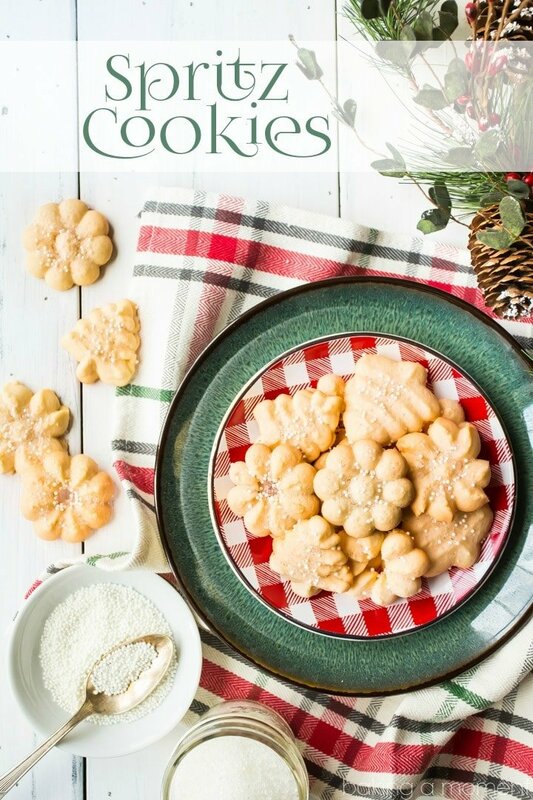 And be sure to scroll past the recipe card, for an affiliate sales link to the cookie press I like best! More great cookie recipes on my “Cookie Recipes Galore” Pinterest board! This post contains affiliate sales links. In a large bowl, use an electric mixer to cream the butter and sugar together until very pale and fluffy (about 5 minutes). Stir in the vanilla and almond extracts until incorporated. Add the egg and beat until smooth. Add the flour, baking powder, and salt, and stir together until just barely combined. Load the dough into a cookie press, and form shapes on baking sheets. Sprinkle with colored sugar/sprinkles to garnish. Bake for 10 to 12 minutes, or until just beginning to turn golden around the edges. 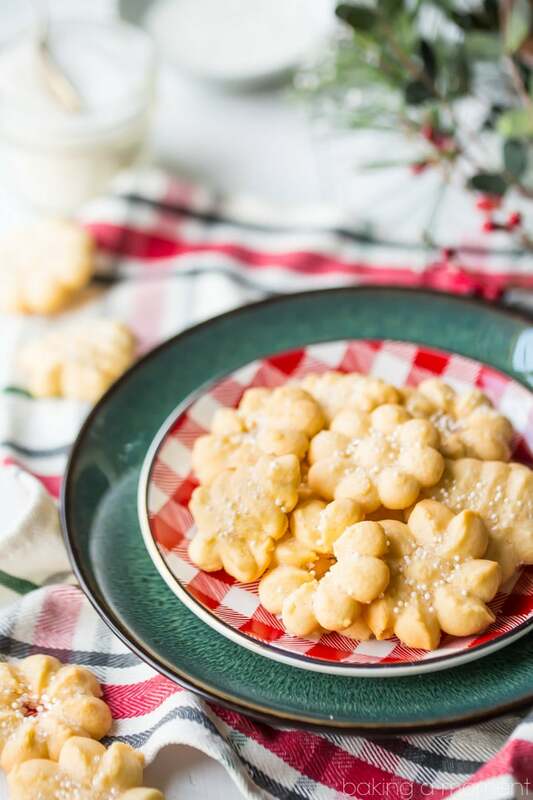 Spritz Cookies are a must around here during the holidays! Same here! Thanks so much for stopping by Erin! Do you have to add almond extract? My grandson is allergic to nuts and tree nuts. Would I add the almond extract equivalent to the mix? Hey Cathy! I liked the added flavor from the almond extract, but you can certainly omit if your grandson has an allergy. Or did you have some sort of substitution in mind? Thank you for your quick reply! I was thinking maybe adding peppermint extract to a batch of the recipe. Would 1/2 tsp be too much? I see. I think that would probably be something you could add to your own taste. Maybe start with 1/4 tsp and give it a taste? I like things minty so I think 1/2 would be fine for me but I’m not sure what you or your grandson would prefer. The amount of extract you add should not have much of an effect on the chemistry of the recipe. I hope that’s helpful! Good luck and have fun! My favorite kind of cookies! Yay! These are really special to me too. Thanks Taylor! Hi Bridget! I’m so happy you’re going to give this recipe a try! Scroll all the way to the bottom of the post (below the recipe card). Just below the Pinterest board you will see 4 image links. The cookie press is the third one from the left. Hope that’s helpful! I hope you do too and I miss you too! Thanks for being gracious about sharing your recipe, and for showing us all how to make Christmas so special! I’m really glad you enjoyed the post. Merry Christmas! Hi Marilu! The link is just below the recipe card, right under the Pinterest board. There are 4 links there, it’s the second to last one. It’s for a Wilton brand press. Hope you enjoy this recipe as much as you did when you’d make them growing up! Your spritz cookie shapes remind me of my mother’s shortbread. I have been looking for a cookie press to replace my ancient “screw” method one, which does not turn out the shaped cookies I desire. I cannot connect with a link to your favorite cookie press. I may be seeing double but I see six links, and none that take me to a cookie press. Help, you’ll save a frustrated Christmas baker. Here’s the link again Lynda, taken from just below the recipe card: https://www.amazon.com/Wilton-Preferred-Press-Cookie/dp/B01EOKKCMW/ref=sm_n_ma_dka_US_pr_snf_0_2?adId=B01EOKKCMW&creativeASIN=B01EOKKCMW&linkId=4635bd5eb10863d363f625b4e88bfd41&tag=yinmomyangmom-20&linkCode=w43&ref-refURL=https%3A%2F%2Fbakingamoment.com%2Fspritz-cookies%2F&slotNum=0&imprToken=i6A2dJkFj8v-dwiu569vXg&adType=smart&adMode=manual&adFormat=grid&impressionTimestamp=1515429583481. Hope that’s helpful! aww your aunt sounds amazing! and these cookies are beautiful and a total Christmas classic! Thanks Kayle! Hope you had a great holiday season! You recipe is identical to mine except I use 1/2 tsp. of lemon extract instead of the almond extract. I think it makes them taste much better – and more palatable to little kids. So glad you and your mom enjoyed! Thanks so much for the great feedback Bridget! Can this spritz cookie recipe be cut in half? Yes! But you will have to use a kitchen scale to split the egg, since it only contains one. These spritz cookies are holiday cookie perfection! Love that you continue the family tradition of baking this for the holidays! Oh my mom used to make similar cookies! I miss them so much. Saving to try. 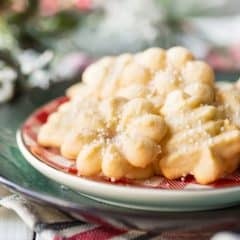 I’ve tried so many spritz cookie recipes, but this is now my favorite! Thanks!!! I love these! Reminds me of when I was little. I googled the “best spritz cookie ever” and your recipe came up. I read the comments and tired it. I really didn’t look at any other recipes before trying it. If I did I might have noticed that the flour is double most of the recipes out there. 4 cups of flour to 1-1/2 cup of butter makes for a very dry cookie. I’m just wondering if 4 cups of flour is correct for your recipe? I wouldn’t make this again, not what I expected. It’s correct! I found that more flour worked better. The cookies bake up crunchy and light, with a nice buttery flavor. Hope you enjoy! Can you add all almond extract or would that be to much? Cathy. I always use lemon extract. It’s from an old cookie press recipe. Very old and very good! Hi can i have the ingredients in ounces or metric instead of cups? Im finding it difficult to try translate. Just click the “metric” button right below the list of ingredients!